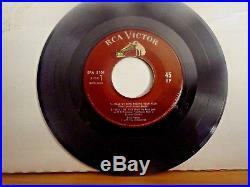 From the mid 1960's , here is a 45 rpm rock&roll record and accompanying hard cover picture sleeve(EPA-5101). The artist is ELVIS PRESLEY. 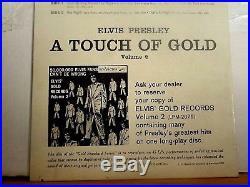 Title of the set is A TOUCH OF GOLD VOLUME 11. SONG TITLES are "WEAR MY RING AROUND YOUR NECK", "TREAT ME NICE", "ONE NIGHT" , AND "THAT'S ALL RIGHT". The record has been well preserved, has plenty of gloss and is graded NEAR MINT. The MAROON label is also graded near mint. The picture cover has no distractions and graded near mint. Bottom right on jacket is shine from flash. Strong professional mailers are used for my items. 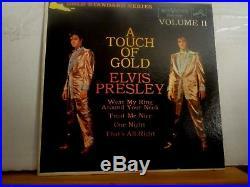 The item "ELVIS PRESLEY A 45RPM EXTENDED PLAY RECORD & HARD COVER EPA-5101(maroon labels)" is in sale since Thursday, December 07, 2017. This item is in the category "Music\Records". The seller is "soundshack" and is located in Beacon, New York. This item can be shipped to United States, all countries in Europe, Canada, Japan.